I have to begin with an apology. An apology for having waited so long to write down this review. The game was first published in 2012 and has been in my hands for over one year now. Quite a long time for a reviewer and nearly an affront against Elad Goldsteem, the sympathetic designer and publisher of the game. Especially because Fallen City of Karez was his first game to be published. So a special apology to Elad! But it is not that I did not try to play and test it. Well, on the one hand, I was quite busy to fit out my attic over the last year, so I had some problems to find some time for games that take longer than 90 minutes. On the other hand, it took me more than one try to understand the rules and every time I began setting up the game, I already had forgotten some details and was lost in the rules to find them again. So it happened more than once that I set-up the game, looked for details I had forgotten and could not find them in the rules. So I ended clearing the table again, because it was too late to start the game after I finally had found out. Luckily enough, most of the time I was only by myself, for the game has a solo variant and I wanted to be sure with the rules before inviting friends of mine for a playtest. And this thing about the rules - anticipating my final evaluation - is exactly my biggest point of criticism and probably also the reason why a lot of other players gave up with the game (as you will read at BCG). But with this review I want to make clear that I can see a lot of potential in the game, despite of the problems with the rules and I want to say you why. The homepage of GOLDEN EGG GAMES tell us, that it is their aim to create games with a strong thematic feeling and a high degree of strategy. 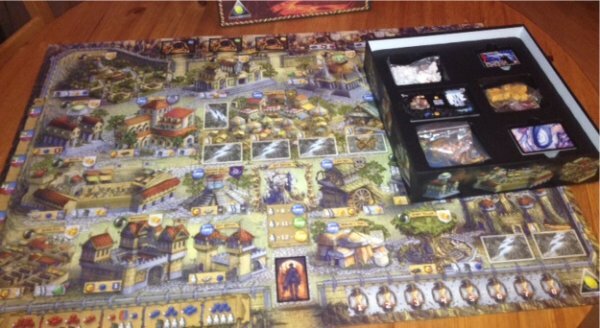 Fallen City of Karez has the classical fantasy theme with some elements of a role-playing game. We, as masters of the guilds try to reawaken a fallen city from the evil for the heir of the king. For this we start with a building of our guild in the city and try to establish a small company of heroes to free the city. After setting up the game most players are impressed by the excellent illustrations on all game components. Antonis Papantoniou, the graphic designer, has really made a great job. Like in Drum Roll he gave the game a fabulous look. Apart from this this we are also confronted with a really huge game board which already is an eye catcher of its own. But in addition we also get a lot of different cards for our heroes, monsters, equipment and so on, and all of them are skilfully illustrated. The players' guilds differ in their equipment at the beginning of the game. Most are equipped with gold and an individual fixed number of monsters and heroes. Also, the guilds get an individual bonus at the end of the game according to their victory conditions. Some of these are quite opposing, so that - despite of the general aim to free the city - the different guilds often have differing plans at given game situations. This results in some interesting decisions during the game and you will always find someone who prevents the group from reaching the general aim all too fast. On the other hand some guilds seem to be slightly stronger than others, so not every combination of guilds can be recommended. This fact was even noted by the author, because we can find suggestions for the constellation for the two-player game in the rules. Finally we only have to shuffle the remaining hero and monster cards as well as the adventure decks and place a starting workforce, consisting of citizens and adventurers, on the centre of the city before we can start the game. A turn begins with an action phase, in which we can plan to use buildings on the map to get new resources, weapons and equipment, acquire new heroes or train our older ones or we can go to the dungeons where our heroes fight against monsters. Heroes and equipment that can be given to our heroes (depending on their skill and free hands) are taken as cards that are laid before us. These cards represent our group of adventurers who can be sent to the dungeons. Continuing with the action phase, we plan actions by placing our available guild tokens into buildings until all players has passed. For most actions in the buildings we need citizens or adventurers from the city centre as the general supply. Every round this general supply is freshly filled with a predetermined number of citizens and heroes, depending on our previous success in the dungeons to free the city. 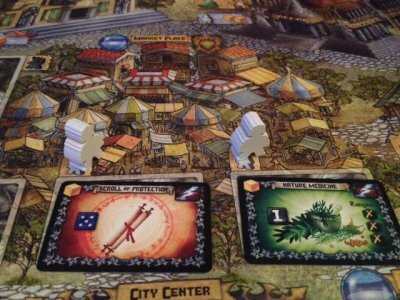 But the general supply in the city centre is limited, and so the players always should plan the next moves in advance. This is all the more difficult, as we perform our actions only in the following phase, the activating phase. Especially with several players, it is possible that there are not enough citizens left to perform all your planned actions. Actions in the players' own guild buildings are avialble to the owners for a lower price, and the players also can acquire more buildings to get rebates there as well.All other players have to pay the full rate of they want to use a building of another player. Looking just at the size of the gameboard, you will have guessed correctly that the game comes with a lot of different buildings, so new players are easily getting confused by the variety. Most of them are simple to understand, once you have understood the symbols on the map. Others like the cemetery, where we can bury and maybe reawaken our dead heroes need some further explanations. But if you have a closer look at the buildings, you will find out that not all buildings are at an active stadium. So, for new players it is possible to stay on the top of things as long as they only concentrate on the few buildings that are open at the beginning of the game. Only if we are successful to attract enough new citizens to the city more and more buildings will open on the map. But, on the other hand, these shops quickly close down again if the population decreases. This happens when citizens or heroes are killed while performing an action. This opening and closing of buildings actually is a quite good example of the richness of detail which can be found in Fallen City of Karez. It is not possible to describe all available buildings and actions within the scope of a review, but many actions have their own kind of consequence, and all of this is part of a larger whole. Myself, I am quite fascinated by these interwoven mechanics, but they are also partly responsible for the fact that it is so difficult to remember/find all rules during play. Back on the map we can also find three different dungeons. Every dungeon is represented by a card, that tell us how many monsters of which kind we will find in the dungeon and what we get if we successfully close down the dungeon by killing all the monsters. In addition, we can build our own "private" dungeon. Why tcould this be necessary? Shouldn't we all follow the aim to close down the dungeons, to reduce the Threat level and so attract more and more citizens? Well, on the one hand we should cooperate for the common goal, but on the other private dungeons will also give you a benefit, at least as long as they are open, i.e. not defeated by a different player. If other players attack these private dungeons, they fight against our private monsters that we also hold in our hands and which can be acquired in the city. The next phase belongs to our heroes if somebody sent them to go to one of the dungeons. In this phase they can show what they have learnt. One or several heroes of a player can explore a dungeon together and here they are - what a surprise - confronted with the monsters. For this encounter Fallen City of Karez uses quite interesting combat rules. Dice will influence the outcome, but they are not used the usual way, since a high sum is not what the players aim for. Instead, both heroes and monsters have given values at which they are wounded. So, for example, a Minotaur could survive two wounds, one with a value of 3 and one of value 4. So, the hero must roll a 3 or 4 to add a wound and the monster does not die before both numbers where rolled. To make things easier, some heroes (and monsters, too) have fixed attacking values, so they can be used directly against specific opponents. The same mechasnism of matching numbers also applies to the defensive dice. As all dice from the heroes are rolled at once, and a successful defence can be used to prevent other heroes from being wounded. As said, this is an interesting new way to determine the result of a combat. The only disadvantage of this rule is that battle sometimes lasts too long. So, especially in the later game (when the dungeon is more populated and the group of heroes has grown) it can result in a an endless rolling of the dice and only the attacker and one of the other players (as the defender) are involved in this encounter. 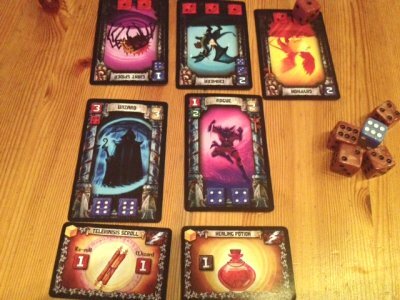 A victorious hero team brings their guild Treasure and Valor cubes that positively influence the Threat level, whereas a failed adventure increases the Threat level in Karez again. The Threat level is finally monitored in the next phase. Only when the players' Valor exceeds the Threat level considerably, Karez can become a real city again, whereas an overflow of the Threat level may mean an early end for all the players' efforts. The game ends latest after the 8th round. If the players have managed to free the city by attracting enough citizens, the player who contributed best will win the game. Despite of all the negative comments in the internet, I really liked the game for its richness and rather atmospheric implementation of the theme. 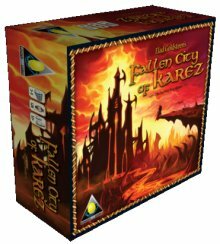 Apart from the partly substandard rules and some minor problems of balancing, Fallen City of Karez is a very promising game, at least as as long as you have a weakness for the fantasy theme. During the first part of the game the players experience a more or less typical worker placement mechanism, but I think players should definitely have at least a small weakness for role-playing games because of the following battles in the dungeons. The game is undeniably equipped with great game material and some refreshing new elements, and so it can be really be recommened for the fantasy and role playing fan, but you must first spend some time studying the rules and the further explanations from the internet before you should invite your friends for a gaming evening. And even then: don't expect the night to end too early!